A ground hostess or attendant is an individual who works for an airline and provides assistance to customers on the ground, while they are still in the airport. He or she will perform a number of different duties depending on their position, and the size of the airline and airport they are working for. The host or hostess may assist with checking in and boarding the plane, among other tasks. Have you always dreamt of a dream job which includes flying across the globe, spending time at an exciting destination, lucrative salary package Inspire Academy Aviation Training Centre will guide you to your dream job/ career. 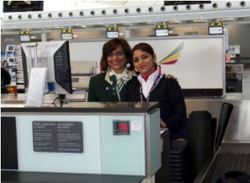 One such rewarding career/ job is of a Cabin Crew/ Flight Stewards. Air hostess is one of the fascinating and valuable professions concerned with making the journey of the passengers more comfortable and safe. It is a service providing job which meets the requirement of the passengers. They are responsible for passenger’s safety and are trained to deal with security and emergency situations. It is a very lucrative career in the industry. Airline Preparation CourseAirline preparation course for CPL students willing to join for upcoming airlines vacancies. This course cover subjects like Air navigation, meteorology, regulation and technical.